Hi! Stopping by for a witty recounting of the gift opening, or the family dinner, or my table decorations? Ummmm……you might want to keep surfing. This ain’t that post. Maybe next week? As this Christmas evening winds down, Christmas exhaustion is setting in, and with it a bit of my annual post-Christmas angst. My own Christmas emotional hangover, if you will. When I was a kid, these feelings of melancholy revolved around the sad, unavoidable fact that there were no more presents to be opened, the boxes all unwrapped, the packaging opened and discarded. Or maybe the disappointment of a well-intentioned gift that just wasn’t anything I had wanted. When I was older, it was the realization that I wasn’t nearly so excited about presents anymore, that I didn’t want toys, and the gifts that represented my looming adulthood didn’t hold nearly the same allure. (Clothes are great, but they’re just not fun, am I right?) Not only that, but maturity brought with it a higher level of responsibility and pressure for the gifts that I chose. I was more aware when a gift I’d chosen had hit its mark, or missed entirely, and I had a growing sense of my own role in the wish fulfillment of others. Having children of my own brought back some of the wonder and excitement, as I tried with my husband to create the perfect Christmas for them, one that represented just the right amount of wishes granted and surprises intuited and reassurance of overwhelming abundance. And this year came really close. Our boys are just about the perfect Christmas age – still young enough to want toys and be excited by them (even if many are electronic), but old enough to nearly make it through the day without succumbing to exhaustion and over-stimulation. We were able to grant many, if not all, of their wishes, and even a couple they had not dared to wish. And miracle of Christmas miracles, each of them of their own accord and initiative expressed sincere gratitude and thanks to us and their grandparents! Still. Perfect as the day was, there are tinges. Tinges of worry, worry that my boys are too spoiled, have too much, and don’t realize the heights of our family’s blessedness. Worry that Christmas with family, with my parents, cannot be forever, and that I didn’t cherish each moment enough. Sadness about extended family members who chose not to be with us, family members whose lives are difficult and painful and outside of my control or ability to make better with a beautifully prepared meal and perfect gift. Sadness that they struggle to heal from wounds inflicted by others whom I could not stop. Perfect as the day was, I know that there are others out there who went without much more even than a meal. I know that my dad lost a friend in a car accident this week, and a friend of mine lost a family member. I know my parents and I grieve my brother, gone 14 years. Worse yet, I know that there are those who go each day without love, without family, without a sense that they belong or are wanted. I know, as a fully “inducted” grown-up, that our world is broken and there is pain and loss and grief, even and especially on Christmas. I know it is normal for me to want to shield my boys from it as long as I can, to somehow reassure them of their place in this world, of how deeply they are loved through the certainty that comes with the granting of Christmas wishes with presents and candy canes. All of this I want to do without allowing them to see or know about the darkness in this world. I think it is probably OK to shield them now, for a little while longer, as long as I accept that nothing I do, no picture-perfect Christmas I provide, can change the nature of that darkness. But I can’t allow that shielding for myself. I can’t turn away from the brokenness or the ugliness in this world. And I have to accept that any attempt I can make to reassure them is pointless and empty ……without that baby. That’s what I gotta keep circling back to, over and over again, ’cause none of it matters without that baby in the manger. That baby, that baby was love piercing the darkness, light piercing the hate, and the only reassurance that matters. He was the Light that shined in our darkness, and the darkness has not put it out. That’s what cures my Christmas hangover. One hour. That’s apparently how long I can muster up Cheerful Crafty Momma Who Enjoys Making Teacher Gifts With Her Children. At least when we start at 7 p.m. on the last day of school before the break, right after The Scary Trip When Mama Pretended It Was Fun To Get Lost Trying To Find The Christmas Tree. 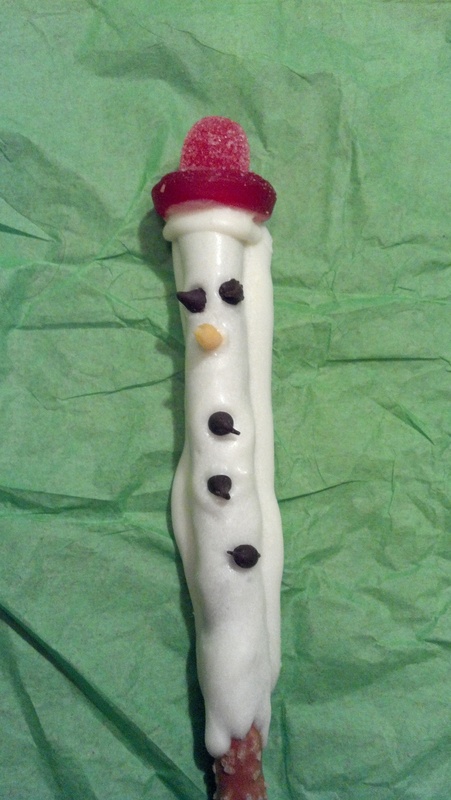 But first things first – I’m so sorry about the demented snowmen. I mean, look at them. I guess they look cheerful enough in a group, which is what I’m hoping will happen when they are distributed as teachers’ gifts tomorrow. But this guy? He looks a bit like a particularly intellectual rabbi. Seriously, I’m thinking my friend Sandra could do this project with her little girl and add side curls to the little guy and take him to her teachers at temple. Oy. Unless they wouldn’t like Orthodox snowmen, cause they’re Reformed, or unless snowmen in general might be offensive, which would not be my intent at all, in which case I’m stumped. At least this guy looks fairly normal, in terms of snowman forehead proportions. Whew. Oops. Didn’t realize he was sans scarf til I posted the picture. Sigh. 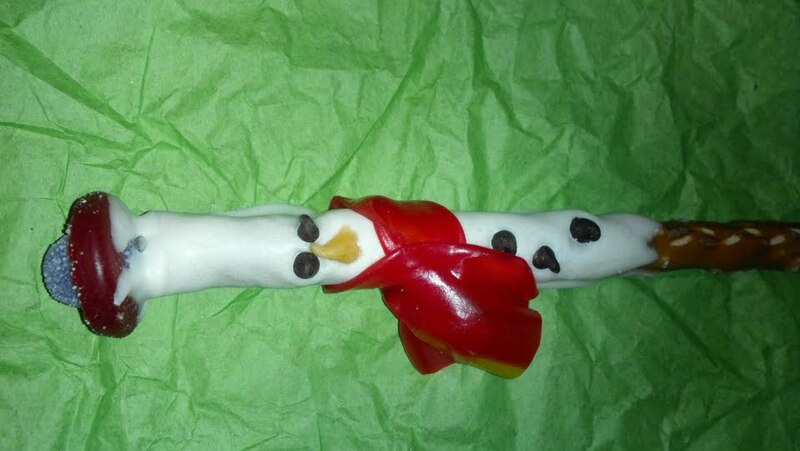 Pause to create one more snowman scarf……….and done. Projects like this, and days like this, are all about me understanding myself. A Given: I WILL try to cram too much into any given time period, and holidays just exacerbate the problem. Which brings us to The Scary Trip When Mama Pretended It Was Fun To Get Lost Trying To Find The Christmas Tree, which happened earlier today when I was SURE we had enough time to go use the half-price Christmas tree deal I’d purchased online a few weeks ago, between after-school pickup, tae kwon do lessons and crafty pretzel snowman creations. Oh, and dinner and homework. And cleaning leaves out of the pond so we can possibly see the leak so we can possibly refill it and get the waterfall pump going so it won’t freeze overnight and be ruined. What do you mean, I can’t fit all of that into 3 hours? SURE I CAN……..cue twitching and spasming. Twitch. Spasm. Twitch. So off we set, blithely into the gray Oregon afternoon, tra la la la la. I figured that the two boys I’d “brung with” and I could pick up a pre-cut tree, look pitifully at someone to help us strap it to the top of the van, and home we’d go. Half hour, tops. Right. Until I realized we were driving about 45 minutes away, into the deep rural woods of …. hey, how’d we get to Kentucky? (I don’t know why exactly it would be scarier to be lost in the foggy woods of Kentucky, but it just seems scarier.) And WOW that is an impressive mid-afternoon total-darkness fog storm of Epic Proportions. (Kind of like Rabbi Snowman’s Forehead.) (No disrespect.) (Thank you, Jon Stewart.) And whattya know, they’re closed when it’s dark out? And it’s u-cut anyways? Well, kids, guess we’ll drive home through the fog at 30 miles an hour, guessing where the road is, and come back Saturday. Cause that’s the key, really, to me living with my particular brand of crazy. Roll With It. As long as mommy doesn’t get cranky, we’re having fun. Whether we’re trying to get out the door to school, or I’m trying to finesse a project at work, or we’re lost in the foggy woods of Kentucky/Oregon, as long as I keep rollin’ with it, it’s An Adventure. And who doesn’t need An Adventure? We can get a tree Saturday, but An Adventure, you take when you can get it. 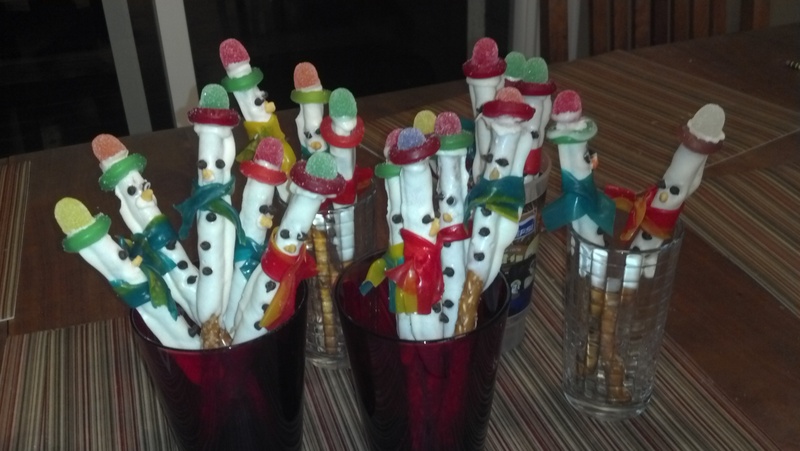 Posted in Uncategorized and tagged snowmen, teachers gifts. Bookmark the permalink.